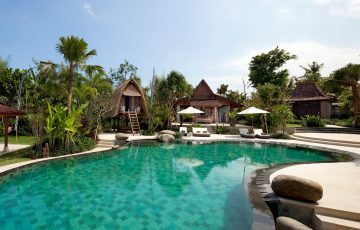 Following are 33 GORGEOUS VILLAS IN CANGGU that are ideal for a family / group holiday or a romantic couples escape. 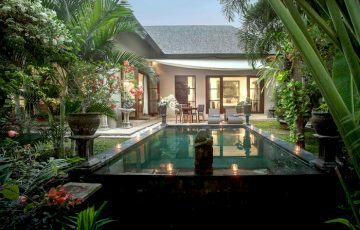 If you are thinking about holidaying in Canggu and want to stay in one of our private Canggu villas, please get in touch with us here at Bali Villa Escapes. We have some exclusive offers and best price deals when it comes to your Canggu villa accommodation. Canggu is a gorgeous and picturesque area about 15 minutes drive from the tourist parts of Seminyak, but offers holiday makers a less hectic, peaceful & more relaxing Balinese tropical holiday experience. 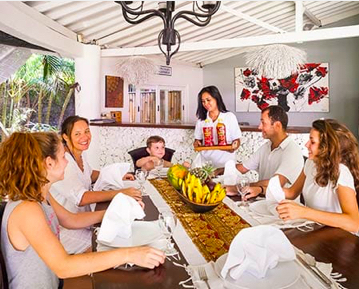 What better way to enjoy the peace, serenity & old world charm that Bali exudes, than staying in one of our luxurious family friendly Canggu villas. 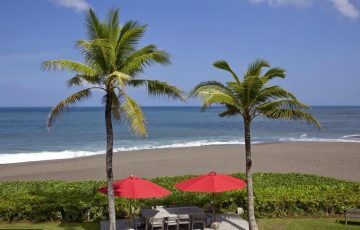 Canggu over the last 5 years has become the ‘go to’ destination for many Australian and international tourists looking for an alternative place to stay in Bali. 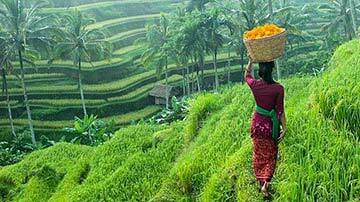 All you need to do is drive around the area and you will see a huge difference from other parts of the Bali. It’s quickly evolving into a very trendy and ‘in place’ for tourists, locals and ex pats who love the vibe and the laid back ‘surfy style’ way of living here. 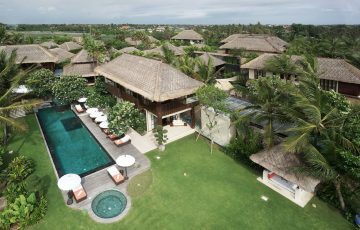 Staying in one of our Canggu villas is even better if you want to absorb the culture and relaxed lifestyle of Canggu. 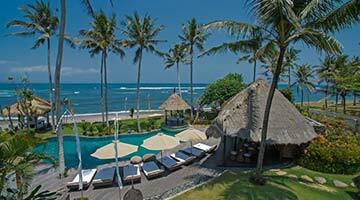 Simply put, Canggu is a great family or group holiday beach destination. The whole area of Canggu from Echo Beach right through to Batu Bolong has undergone a complete transformation; with trendy bars, day spas, yoga studios, gyms, a diverse range of restaurants, co-working spaces, lots of surf shops, skate parks for the kids, health conscious cafes and of course all the local & well known fashion boutiques. This influx of tourism has led to the development of some absolutely gorgeous holiday villas, where you can get all the creature comforts of modern day living close to the centre of Canggu’s main shopping & dining strip. If you want some added excitement on your holiday, the famed Seminyak’s Eat Street shopping & dining precinct is only 15 minutes away. Most Canggu villas will have a manager who will be able to organise transport for you to get there. For those that are a bit more daring they can rent a scooter and cut the travel time in half between Canggu & Seminyak. 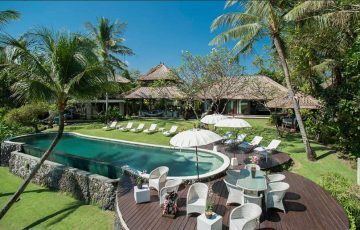 We have the whole of the Canggu area completely covered when it comes to luxurious villa accommodation and holiday villa rentals. All of our Canggu villas are all hand picked for their quality, location near Echo, Berawa or Old Man’s Beach, exceptional level of service from the villa staff, luxurious swimming pools and superior standards. Whether your wanting a 1, 2, 3, 4, 5, 6 or 7 bedroom villa; we have the largest range and choice of options to suit any taste, style or holiday budget. Get in touch with the team that knows Canggu best by contacting Bali Villa Escapes. 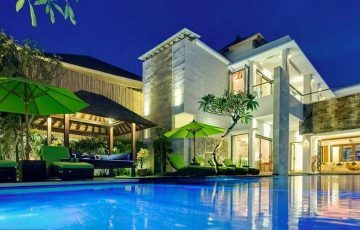 Villa The Maya is a brand new, two storey 4- bedroom villa located on the doorstep of beautiful Berawa Beach area of Canggu. Four en-suite bedrooms can accommodate up to 10 guests. Unwind on the rattan lounge in the bale by your private pool. The whole family can enjoy the facilities nearby at the renowned, Finns Recreation Club. 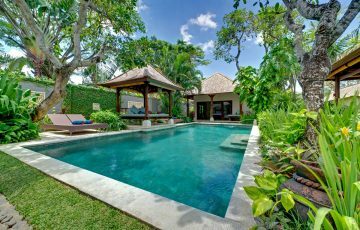 This is an amazing villa and one of our most popular in Canggu - please book this well in advance. 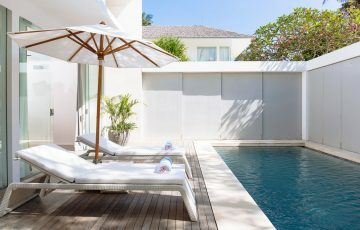 Just a short stroll from the glistening shores of Canggu Beach on Bali’s southwest coast, Villa Kedidi is a delightful 3-bedroom villa with 10 metre swimming pool is perfect for the kids. Chill in the open-sided living and dining pavilion or poolside balé. Affordable holiday luxury in hip & happening Canggu! 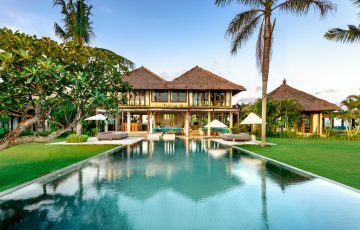 Villa Luwih in Canggu has been thoughtfully designed to capitalize on its prime location overlooking Pererenan Beach on Bali’s dramatic and unspoiled south-west coastline. Guests will love the poolside bar, state-of-the art media room with its giant 60-inch TV and surround-sound. Can accommodate 12 guests and is suitable for guests of all ages and all interests. This stunning 3 bedroom villa sits beside a small river with a “to die for” private swimming pool and beautiful furnishings, Villa Mako is sure to impress. Kick back in the Jason recliner while watching a DVD or a spot of sport on cable TV. 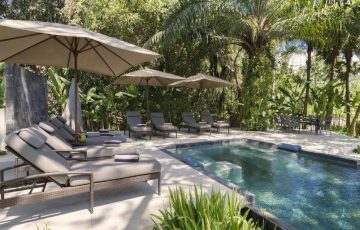 Villa Pangi Gita is a fabulous 3 bedroom Canggu villa & gently flows down a terraced hillside to the tranquil, ‘singing’ Pangi River. The lovely kidney shaped pool sits by the river surrounded by lush tropical gardens. The Jacuzzi bathtub will take you far from the stresses of your city life! 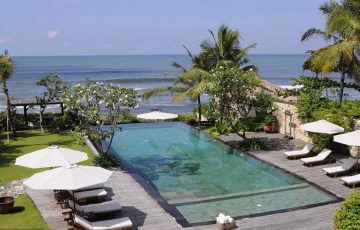 Villa Puri Bawana is 5 star luxury all the way in one of the best locations in Canggu; Jalan Batu Bolong. Your close to so many fabulous cafes, health food shops, restaurants, bars, and the beach. This villa is in the heart of trendy & the very vibrant Canggu scene. With 5 bedrooms & a compliment of villa staff to ensure very holiday wish is taken care of, this is one of our best Canggu villa rentals. 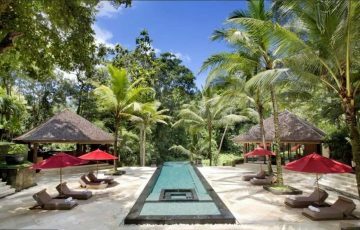 Absolute beach front, Sungai Tinggi Beach Villa is a vast (2.7-hectare) rural estate on Bali’s south-west coast, within easy reach of Seminyak, Canggu central and Echo beach. 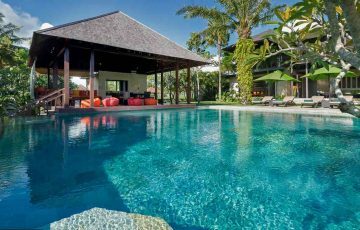 This 6-bedroom Canggu villa has to be seen to be believed. It has over 100m of private beach for your exclusive usage. If your looking for a wonderful beach style Bali holiday then this villa is it!! Just 10 min walk to the beach and 15 minutes from some of the best dinning, entertainment and shops of Seminyak, Villa Kouro offers absolute luxury tropical living. Get pampered by the highly trained staff including one chef, three housekeepers security guards. This is a fabulous 5 bedroom Canggu villa that you'll love from the moment you see it. A very classy 4-bedroom holiday villa offering minimalist architecture and chic décor, Villa Canggu South is also ideal for small weddings and events for up to 40 guests - but best for families or groups wanting a beach style holiday in the trendy Canggu area. Villa Inti really is the home away from home. There are five air-conditioned bedrooms in total each with a private en-suite bathroom, fantastic swimming pool area, fully air-conditioned media room and open-air living and dining area featuring a stunning wooden dining table. Chic, white and elegant is where it’s at with this little gem of a villa (Villa Puro Blanco) that comfortably accommodates 8 guests. 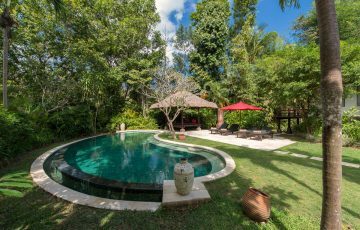 Amazing rice field views and part of a villa complex situated a short walk from the beach and conveniently located just 500 metres from the exclusive Canggu Club and the Canggu Deli. On the doorstep of the famed surf spot that is Echo Beach, Villa Asante offers a large pool for the adults but really looks after the kids with a selection of games, pool toys, table tennis, badminton and volleyball sets as well as an Xbox in the TV lounge. There’s even a 10 x 2 x 0.3-metre paddling pool so they can happily splash about all day. 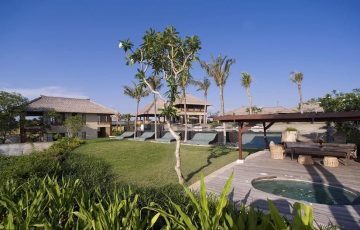 Villa Bendega Rato is one of the largest 3 bedroom Canggu villas and it provides true luxury easily seen in the exceptional furnishings, fittings and finishing. The outdoor bale at poolside is an exceptional outdoor entertainment area as is the sunset deck at rooftop. Your also in a sensational location close to the popular Jalan Batu Bolong shopping & dining area. It doesn't get much better than this! If you’re into cinema, photography and the arts then this cute little 2 bedroom villa is right up your alley! 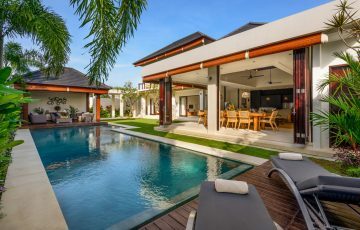 Connected to Villa Canggu South, these two villas can be combined to cater for larger groups and is only 100 meters from the beach. A great villa in a top location. 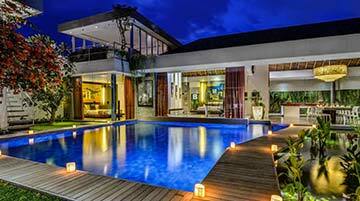 Villa Manis is a luxurious 8 BR holiday villa in Canggu & can sleep up to 16 guests comfortably. Decorated with beautiful artworks and furnishings, it provides large living areas however it still manages to give somewhat of a cozy feel for guests. With its wonderful infinity pool, Villa Manis is hard to fault. Plus you in a sensational Canggu location. Take the family for the holiday of a lifetime! Vila Dea Amy (3 bedrooms) provides a real sense of tropical living while being amidst luxury accommodation that exemplifies some of the most intricate craftsmanship Bali has to offer. Slip into a slumber by the koi pond as the sound of trickling water calms the senses. 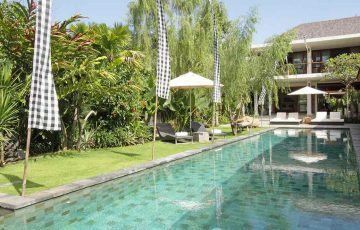 Great Canggu location within easy walking distance to so many fabulous cafes & restaurants. This is affordable luxury! 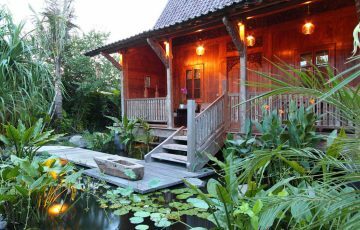 If its romance you’re after then look no further than this quaint little 1 bedroom Canggu holiday villa. Featuring a large King size en-suite bedroom, sitting and TV area in bedroom pavilion, verandah with seating, gladak building dining table for 3 and verandah, poolside sun-deck and balé, air-conditioned gym with recumbent cycle, treadmill, weight station and Powerplate. 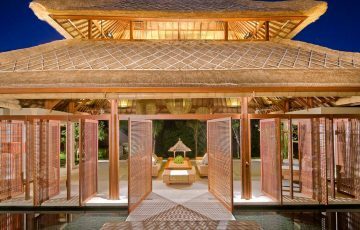 Villa Sea Sati in Canggu comprises a series of individual pavilions, well screened in delightfully established gardens. The largest of these is the open-sided living pavilion, which looks over an amphitheatre style performance space near the large free-form swimming pool. This is the perfect 4-bedroom family or group holiday villa for those that want a beach style holiday. Affordable luxury near so many great things to see & do. 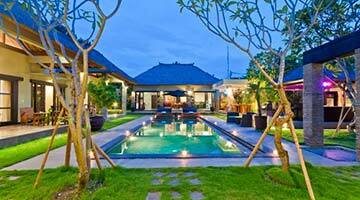 Villa Dea Sarasvati is one of the best Canggu 4-bedroom villas for a family or group holiday. If swimming laps in the 20 meter swimming pool isn’t enough then head to the fully equipped gym and burn a few calories on the recumbent cycle, treadmill, weight station and Powerplate. 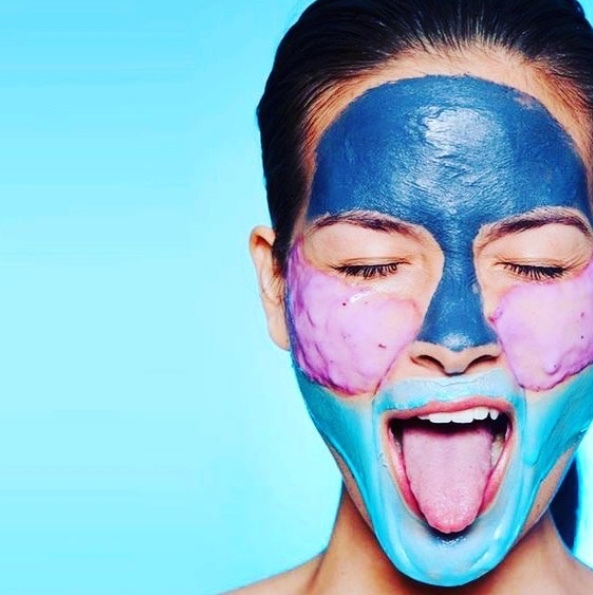 Then pamper yourself in the dedicated air-conditioned Dea Spa. Villa Saba Bima is a fabulous 2 bedroom villa in the trendy Canggu area. This is affordable luxury in a top beach side location. 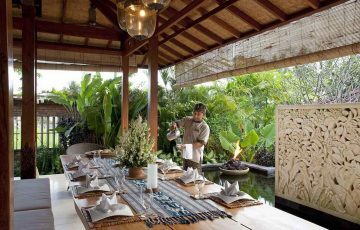 With a full time chef & breakfast included PLUS free airport pick up, this is one of those Canggu villas you have to see. 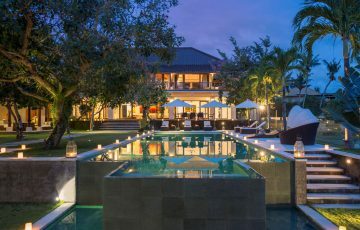 The epitome of complete luxury awaits you when you stay in this gorgeous 5 bedroom 'beachfront holiday villa in Canggu. At Villa Ambra you will feel completely relaxed and pampered by the team of villa staff who will take care of every holiday need. This is a beachfront holiday villa which means you can surf, snorkel, swim in the ocean or take in those fabulous afternoon sunsets from the comfort of your own private villa. So please make sure you book this well in advance especially, if your planning a trip to Bali during the Australian school or public holidays. Villa Avalon is possibly one of the best 1 bedroom romantic or couples holiday villa for rent in Canggu. Although it only sleeps two guests there is no compromise when it comes to the spacious indoor and outdoor living areas, beautifully appointed! 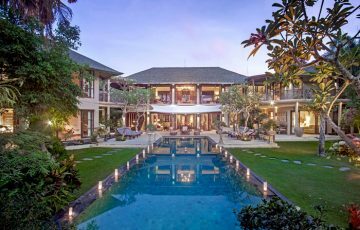 Villa Avalon is an expansive 4 bedroom Canggu villa built over two storeys is set on 2,000sq meters of manicured tropical gardens. All suites are provided with only the finest towels, robes, toiletries, and linen, as well as modern amenities for total pampering and comfort. Beachfront, luxury holiday villa in vibrant Canggu. If you want to live the high life and be immersed in total comfort on your next Bali vacation, then 5 bedroom Villa Mary is the obvious choice for many reasons: beachfront location, staff, chef, stunning pool, well maintained lush tropical garden area, security, tennis court, not to mention the most6 fabulous sunset views from your own private retreat. Do yourself a favour and rent this sensational villa. 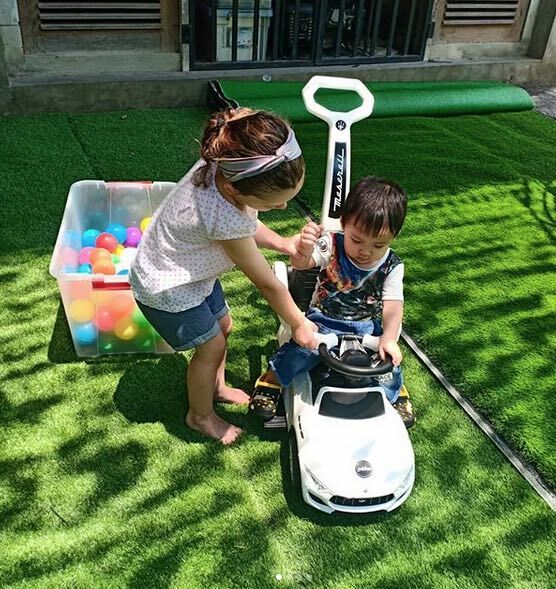 If there’s a family or group that needs accommodation then Villa Avalon a 7-bedroom Canggu beautifully appointed holiday villa will surely do the job. The entertainment room is full of books, board games, DVDs and DVD player, large flat-screen television, comfortable lounges, and a great billiards table. Plus you are trendy and popular Canggu where there's so much to see & do. Thinking of hosting a special event in Bali, maybe your dream wedding? 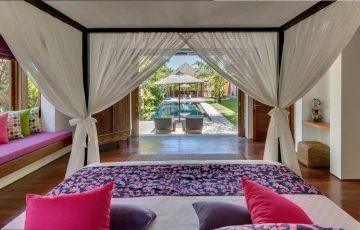 Well make sure you put Villa Shalimar Canggu on the short list, with 12 bedrooms there is ample accommodation for up to 24 guests, perfect for the bridal party and close relatives wanting to stay together for the once in a lifetime event. The luxury villas expansive manicured lawns and ocean backdrop make this a very popular choice among our clientele seeking a little slice of paradise. 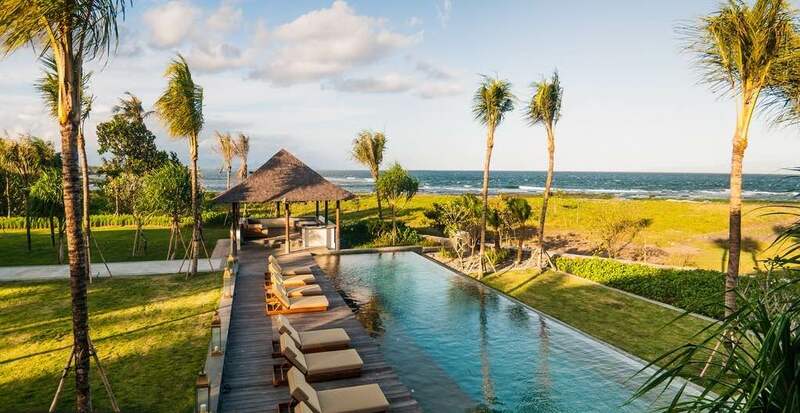 If the idea of a beach front location in the trendy area of Canggu is your idea of holiday bliss then you should be taking a closer look at Villa Waringin. 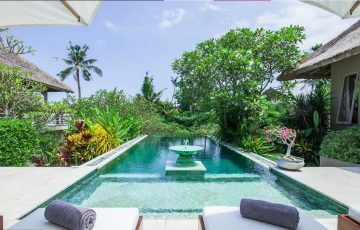 With 6 fully private en suite bedrooms, chefs, villa staff, amazing infinity swimming pool and loads of room for the kids to play this is one of the most luxe villas you will ever find in Canggu to rent for your next holiday. There's also a tennis court, media room as well as fully security. Waringin is ideal for large groups or events. 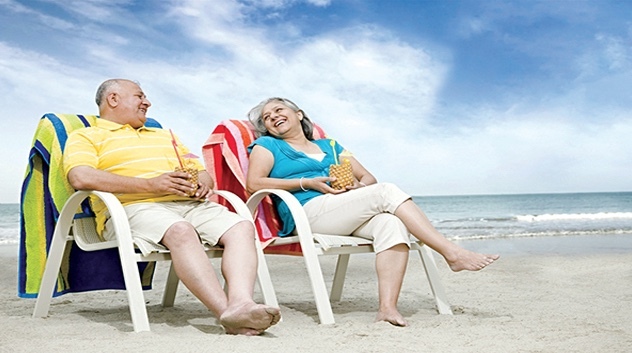 11 Luxe Villas in Bali – Perfect for Seniors!